We live in the generation of Right Now. We want everything quickly — Instant credit, fast food, instant news. We’ve been raised on 30 second commercials and 140-character status updates. We simply don’t have attention for anything that takes a long time. Watch how people fidget in the grocery store line, at the Post Office, or at a red light. But discipleship is a long endeavor, not a quick fix. Character growth with God is like an oak tree that takes years to mature. Is your faith on simmer, or on boil? Comment here. 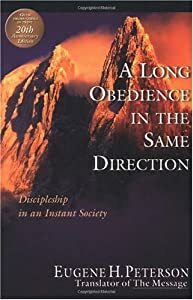 This entry was posted in A Long Obedience in the Same Direction: Discipleship in an Instant Society, Post Office. Bookmark the permalink. This posting is so true and telling of today's age. I was just at the post office today at the automated teller and the person in line behind me kept huffing and puffing audible enough for me to hear. Obviously, the line was not moving fast enough for her liking. This posting captures this theme, we definatly need to take time and analyze our faith each day. I think I need to read that book. My faith simmers…sometimes it seems like it completely cools off — and I always want it to be rapid boil — unrealistic expectations perhaps? !